Among other works by a New Zealand chap named Eric Partridge is one of the classic guides to good English, a book entitled Usage & Abusage. When this title crosses my Words With Friends mind, I sometimes think of it as Use & Abuse. This week's review could take an even shorter form as its title -- Us & A Bus (hey, get on the bus). You wait for one bus-based breakfastery to come along -- hi to the Holeshot Cafe -- then along comes another. Follow those yellow and black "Stack Area" signs near Bucklesham, turn off towards Levington and keep 'em peeled for a bright yellow bus, c/w Pudsey-esque spots. Laid up in the layby is the Doubledeck Diner, the lightly fried meat in the sandwich formed by the A14 and Felixstowe railway line. Inviting words on that big sign: CAFE OPEN. Step up, no ticket required, and there in the stalls is the counter and kitchen area. Poised, Summer Holiday-style like a spatula boy, is Keith, ex-London bus driver and proud owner. Everything's cooked to order, gents: what can I do for you? Full English for Andy, the guts, and a diet-conscious egg & chips for me, plus a Dr Pepper from that handy drinks fridge. Orders placed, up to the circle we go, though not before Andy has asked that £6.40 question: does the bell still work? Yes, it does. Upstairs is great. There's proper tables between the original fabric seats, and even a pine dining table at the rear. Makes you feel like a kid on a school outing. 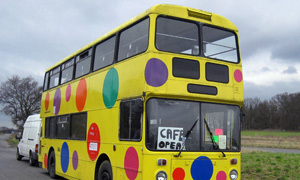 Talking of which, our Keith even does kids' parties if you can provide the parking space. Andy's eyes goggle when his generous plate arrives, including a flat-ish Scottish sausage. Thumbs up for my thinly sliced chips and nicely cooked egg. Very much does the job. A chat with the chef and proprietor reveals that he had that Richard Hammond in here the other day, probably scooted over from Top Gear filming at Rendlesham, and that Keith gives the odd wake-up call to sleeping lorry drivers parked nearby. Like the Holeshot, there ain't no cakes, so it's a mug of coffee and a choccy bar: I'm from Mars, Andy is from Snickers. Go give him your business and get on board with the Doubledeck Diner. If it was a car -- Leyland Atlantean. If they were passing by -- Richard Hammond.